Last month, a toucan was brutally attacked by a bunch of youths in Costa Rica, an assault that left the poor bird mutilated and missing a substantial chunk of its beak. And the world was not happy about it. The incident quickly earned a lot of attention online, and it didn’t take long for people to dip into their pockets to help the fella out. Now, thanks to the generous public, the animal’s outlook may not be so miserable as he is set to receive a prosthetic replacement. According to BBC News, four different companies in the country said they have the skills to help him and have volunteered their services to 3D print the bird a new beak, which could be the first time that a toucan has received such a prosthesis. However, scientists know that such a procedure can be successful as prosthetic beaks have been fitted on an eagle and a penguin before. The grizzly incident took place in January when a group of teenagers from the town of Grecia began beating the bird with a piece of wood. The bird is wild, but locals feed him and play with him, so he had become a sort of mascot for the town and was consequently named after it, according to AFP. The maimed bird was brought to veterinarians working at an animal rescue center in Alajuela, who have been nursing Grecia ever since. Although he is managing to recover despite his disfigured beak, the vet who has been looking after him, Carmen Soto, told BBC News that he can only eat very small amounts on his own and therefore needs assistance. Outrage quickly spread when people learned about Grecia’s attack and his story went viral throughout Latin America. A social media campaign was then kick-started by Luciano Lacayo and, using the hashtag #savethetoucan, more than $7,000 was subsequently raised on the crowdfunding site Indiegogo, 3dprint.com reports. Amazingly, the campaign smashed its $5,000 goal in less than 48 hours, according to Tico Times. 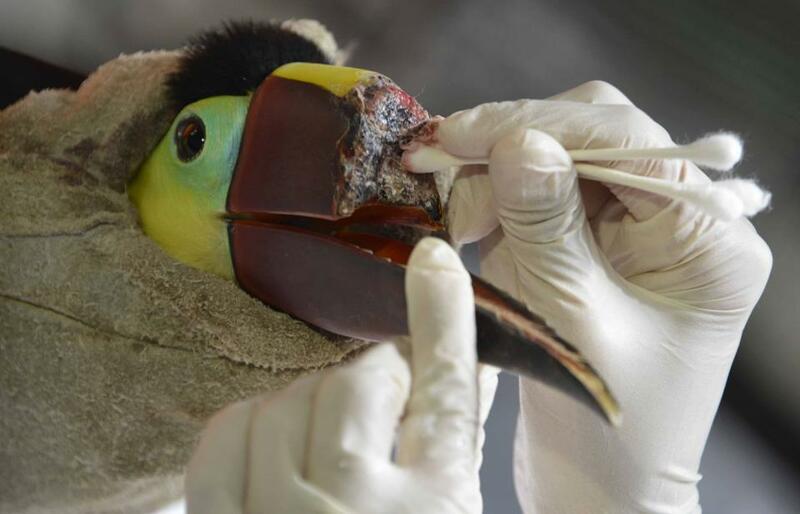 Four Costa Rican companies have now offered to help print Grecia a replacement beak to help him eat, and volunteers are already studying toucan bills to come up with a suitable model. According to designer Nelson Martinez, the prosthesis will have a fixed part and a mobile part so that it can be cleaned or replaced as necessary. But first, his wounds need to heal before scans can be made to create the models. In spite of these efforts, Grecia’s future remains uncertain as he may not accept the replacement. Furthermore, their colorful bills serve as thermoregulation tools and are also used in mate selection. Unfortunately, this sad story isn’t the first gruesome example of animal cruelty that has come out of Latin America. For example, just last month, a group of people blew up a dog with fireworks in Honduras and posted the footage online. Such cases usually go unpunished since laws against such acts are either weak or non-existent, and many people get a $2 fine and a slapped wrist. But that could be set to change soon as activists are calling for tougher punishments, and pressure from social media protests help raise awareness.